The example REST interface, presented as a traditional Object Store running on traditional spindles, does not require a high performance caching tier. 10 GbE horizontally scalable spine leaf back-end storage and front end network. 10 storage servers each with 12x4 TB disks equaling 480 TB total space with approximately 160 TB of usable space after replicas. It may be necessary to implement a third party caching layer for some applications to achieve suitable performance. 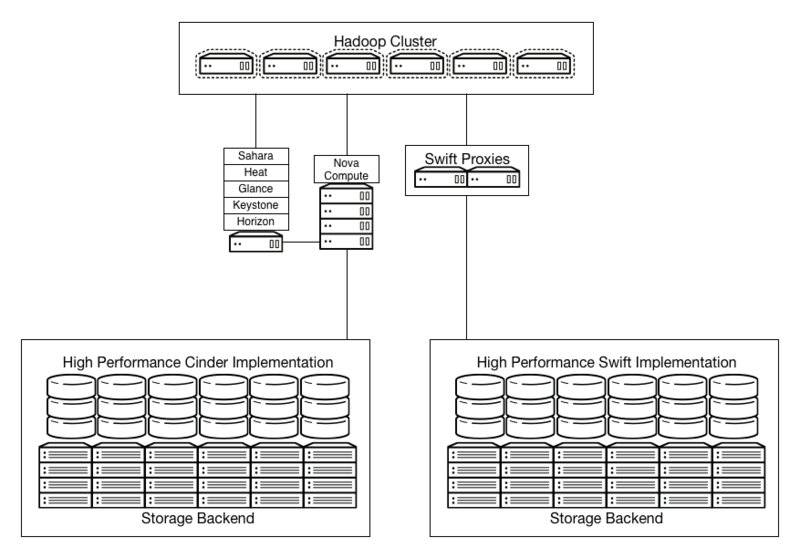 Analytics of large data sets are dependent on the performance of the storage system. Clouds using storage systems such as Hadoop Distributed File System (HDFS) have inefficiencies which can cause performance issues. One potential solution to this problem is the implementation of storage systems designed for performance. Parallel file systems have previously filled this need in the HPC space and are suitable for large scale performance-orientated systems. 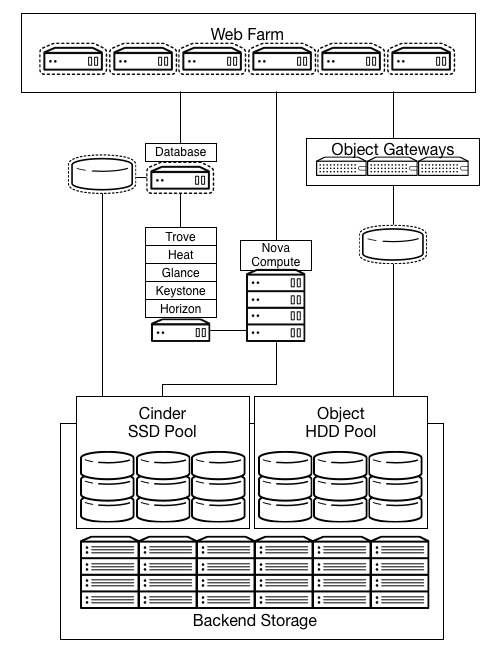 The hardware requirements and configuration are similar to those of the High Performance Database example below. In this case, the architecture uses Ceph’s Swift-compatible REST interface, features that allow for connecting a caching pool to allow for acceleration of the presented pool. Databases are a common workload that benefit from high performance storage back ends. Although enterprise storage is not a requirement, many environments have existing storage that OpenStack cloud can use as back ends. You can create a storage pool to provide block devices with OpenStack Block Storage for instances as well as object interfaces. In this example, the database I-O requirements are high and demand storage presented from a fast SSD pool. A storage system presents a LUN backed by a set of SSDs using a traditional storage array with OpenStack Block Storage integration or a storage platform such as Ceph or Gluster. This system can provide additional performance. For example, in the database example below, a portion of the SSD pool can act as a block device to the Database server. In the high performance analytics example, the inline SSD cache layer accelerates the REST interface. 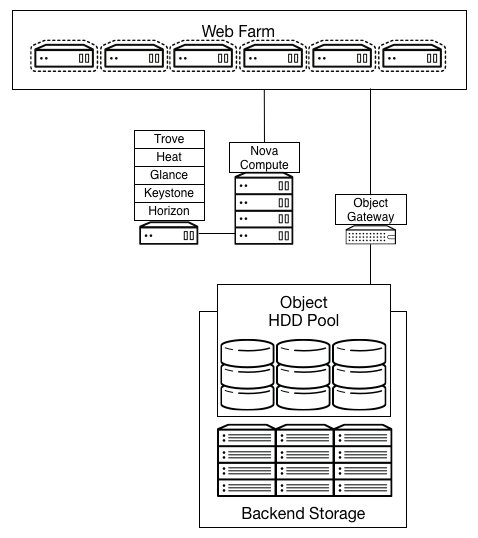 In this example, Ceph presents a swift-compatible REST interface, as well as a block level storage from a distributed storage cluster. It is highly flexible and has features that enable reduced cost of operations such as self healing and auto balancing. Using erasure coded pools are a suitable way of maximizing the amount of usable space. There are special considerations around erasure coded pools. For example, higher computational requirements and limitations on the operations allowed on an object; erasure coded pools do not support partial writes. Using an SSD cache layer, you can present block devices directly to hypervisors or instances. The REST interface can also use the SSD cache systems as an inline cache. Storage-focused OpenStack clouds must address I/O intensive workloads. These workloads are not CPU intensive, nor are they consistently network intensive. The network may be heavily utilized to transfer storage, but they are not otherwise network intensive. A key consideration in a storage-focused OpenStack cloud is latency. Using solid-state disks (SSDs) to minimize latency and, to reduce CPU delays caused by waiting for the storage, increases performance. Use RAID controller cards in compute hosts to improve the performance of the underlying disk subsystem. Depending on the storage architecture, you can adopt a scale-out solution, or use a highly expandable and scalable centralized storage array. If a centralized storage array meets your requirements, then the array vendor determines the hardware selection. It is possible to build a storage array using commodity hardware with Open Source software, but requires people with expertise to build such a system. On the other hand, a scale-out storage solution that uses direct-attached storage (DAS) in the servers may be an appropriate choice. This requires configuration of the server hardware to support the storage solution. Ensure the connectivity matches the storage solution requirements. We recommend confirming that the network characteristics minimize latency to boost the overall performance of the design. Determine if the use case has consistent or highly variable latency. Ensure that the storage solution throughput is optimized for your application requirements. Use of DAS impacts the server hardware choice and affects host density, instance density, power density, OS-hypervisor, and management tools.